الجالية المصرية في بريطانيا تحتفل بنصر أكتوبر في أمسية بعنوان "مصر جميلة"
لجنة من الجالية تبعث برسالة لـ"منصور" و"السيسي" تحثهما فيها على "التقدم بخطى ثابتة نحو المستقبل"
تقيم الجالية المصرية في المملكة المتحدة، اليوم، أمسية تحت عنوان "مصر جميلة"، احتفالا بنصر أكتوبر، استضافت الشاعر الكبير أمين فؤاد حداد، والباحث إسماعيل السعداوي، الذي ألقى محاضرة بعنوان "الجيش في مصر القديمة". وعلى هامش الاحتفالات زارت نخبة من أبناء الجالية تضم الدكتور حازم الرفاعي، والدكتور سميح عامر، الملحق الطبي المصري، والدكتورة شيرين صالح، المصابين من رجال الأمن المصري الذين استدعت أصاباتهم نقلهم إلى مستشفيات لندن لتلقي العلاج. وتحتفي اللجنة ببعض المصابين من رجال الأمن تعبيرا عن العرفان والتقدير لهم أسوة بأبطال نصر أكتوبر المجيد لما بذلوه من تضحيات فداء لأمن وسلامة الوطن، وقررت اللجنة تكريمهم وتحيتهم على هامش احتفالات نصر أكتوبر، كما وجهت الجالية رسالة تقدير وإعزاز للمستشار عدلي منصور، رئيس الجمهورية وللشعب المصري ولأبطال القوات المسلحة البواسل في ذكري النصر العظيم. Read more: Egyptians in London cerebrate 6th October with musical "Arabic"
Thirty million people in the streets of Egypt, with the help of the Egyptian military, have saved the United States from the consequences of its disastrous policy of supporting the Muslim Brotherhood since President Barack Obama came to office. Just months after his inauguration in 2009, Mr. Obama appeared in Cairo to address the Muslim world. He ensured that members of the Muslim Brotherhood were seated in the front row of the auditorium at Cairo University. Since the group was still officially banned in Egypt, no one from President Hosni Mubarak’s administration could attend. The message from the seating arrangement was unmistakable: even at the price of snubbing his official host, Mr. Obama recognized the Muslim Brotherhood as a legitimate player in Egyptian politics. Already, this was clearly interference in the internal affairs of the Egyptian state. In her debut performance as national security adviser, confronting the Egypt crisis, Susan E. Rice (and her boss, President Obama) failed miserably. The failure is particularly acute on the part of Mrs. Rice, though. After all, she was the U.S. ambassador to the United Nations, where she was amply exposed to the meaning of the phrase “strongly condemns,” the one chosen Thursday by the president and his national security team to castigate Egypt’s interim government and military for its crackdown. Surely, Mrs. Rice’s experience with U.N. Security Council resolutions taught her the consequences of the words “strongly condemns.” In deeming one party’s action to be those of an aggressor, license is given to the “victim” to engage in an expanded notion of self-defense. From his historic Cairo Speech President Obama sought to empower moderate Muslims, including the ‘moderate’ Muslim Brotherhood. The election of Muslim Brotherhood’s Mohamad Morsi was hailed as a slam-dunk for democracy and earned Washington’s backing. But a year later, 22 million Egyptians saw things differently, returning to Tahrir Square and prompting the military to give Morsi and company the boot. 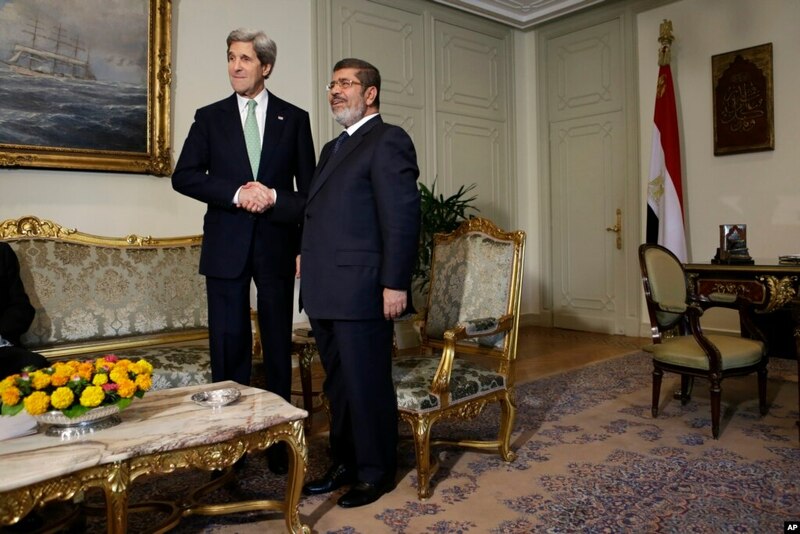 Secretary of State Kerry is to be commended for declaring that the Egyptian military was "restoring democracy" by deposing Morsi. Now the U.S. should drop its flawed Muslim Brotherhood policy. Never a force for moderation, it should be recognized for what it is: An enemy of freedom and tolerance-- a hate group with a long enemies list. CAIRO (Reuters) - Security forces must do more to protect Egypt's Christian minority in the turmoil following the military overthrow of Islamist president Mohamed Mursi, rights groups said on Tuesday, citing the mob killing of four near the southern city of Luxor. Coptic Christians account for about a tenth of Egypt's 84 million people. They have suffered discrimination for decades, but communal tensions and attacks rose sharply under Mursi, who was elected president a year ago following the fall of strongman Hosni Mubarak in 2011. The army deposed Mursi on July 3, unleashing violent street clashes and exposing deep fissures in the Arab world's most populous nation. The killing of more than 50 people at a demonstration in support of ousted Egyptian President Morsi in Cairo on July 8 has justifiably horrified many in Egypt and internationally. The pro-Morsi elements have placed the blame on the military forces, while the military claims it was attacked with live ammunition. While accusations are hurled back and forth, a new aspect to this story is emerging – the presence of a third force, namely snipers stationed on rooftops firing at both sides of the conflict. This revelation raises serious questions about the true nature of the conflict in Egypt and the disturbing similarities between this incident and similar ones in Syria, Thailand, and elsewhere. As thousands gathered near the Republican Guard headquarters where many believe the Egyptian military is holding former President Morsi, violence erupted, killing at least 51 people and injuring hundreds. The bloody incident marked a clear transition from a purely political conflict to a potential civil war. According to military officials, pro-Morsi “terrorists” attempted to storm the building, thereby eliciting a violent response from the military forces defending themselves. Colonel Ahmad Mohammad Ali, a spokesman for the Egyptian military claimed that police personnel were attacked while attempting to secure the area. He noted that, “They were on top of buildings…they either fired or threw things down…they were firing live ammunition and the military had to defend itself.” Colonel Ali’s comments have been echoed by most major media outlets in Egypt which are largely controlled by forces sympathetic to the military and the former Mubarak regime. However, the Muslim Brotherhood and other pro-Morsi forces paint a distinctly different picture. As Egypt heads toward an uncertain future, the military continues to be supported by the overwhelming majority of Egyptian citizens. Editor's note: H.A. Hellyer is a non-resident fellow at the Brookings Institution and ISPU. A writer on Egyptian politics, he held senior posts at Gallup, and the University of Warwick. (CNN) -- Was the ousting of democratically-elected Mohamed Morsy in Egypt a coup? Answering that question is clear, but not without a very clear qualification. It is a popularly legitimate coup -- and focusing on it is now far less important than what comes next. The events that led to the Egyptian army's removal of President Mohamed Morsi confronted the military with a simple choice: intervention or chaos. Seventeen million people on the street is not the same as an election. But it is an awesome manifestation of people power. The equivalent turnout in Britain would be around 13 million people. Just think about it for a moment. The army wouldn't intervene here, it is true. But the government wouldn't survive either. The Muslim Brotherhood was unable to shift from being an opposition movement to being a government. Of course governments govern badly or well or averagely. But this is different. The economy is tanking. Ordinary law and order has virtually disappeared. Services aren't functioning properly. Individual ministers did their best. A few weeks back, I met the tourism minister, who I thought was excellent, with a sensible plan to revive Egypt's tourist sector. A few days ago, he resigned, when the president took the mind-boggling step of appointing as governor of Luxor (a key tourist destination) someone who was affiliated to the group responsible for Egypt's worst-ever terror attack, in Luxor, which killed more than 60 tourists in 1997. President Obama and important inner circle leaders had hoped to install the Muslim Brotherhood in Egypt and throughout other parts of North Africa and the Middle East. Issues related to enforced dhimmitude on Coptic Christians, the future rights of women, mainstream Islam, secular Egypt and a whole array of countless different thought patterns all faced a grim future. Even Saudi Arabia, a close ally of America, was watching events uneasily because the tentacles of the Muslim Brotherhood and their real objectives remain masked in uncertainty. The billions of dollars from the Obama administration to the Muslim Brotherhood led President Morsi (Mursi) which was a continuation of past economic policies under Hosni Mubarak – without the Islamist angle – meant that vast numbers of Egyptians couldn’t trust Morsi or Obama. Now the Obama administration is threatening to withhold military assistance to Egypt by dancing around formalities which can be bypassed with ease if desired. After all, shipping military weapons to third parties which benefit al-Nusra and other al-Qaeda affiliates is a cinch when it comes to trying to defeat the government of Syria. Just like invading Iraq under a false pretext but suddenly Obama is using lofty ideals which don’t exist in reality under his leadership. However, he may be forced to backtrack on military assistance because being on the wrong side of history he now needs to play catch up because Egypt is too powerful to ignore. Egyptian financial markets have been rattled by a deepening political crisis in the pivotal Arab state, sending the cost of insuring against a government debt default to a record this week. A combative speech by Islamist president Mohamed Morsi late on Wednesday plunges the market and failed to assuage fears that Egypt’s various political movements could clash violently at a planned mass demonstration of government opponents on Sunday. The lynching of four Egyptian Shi’a citizens by mobs is raising alarm bells with regard to the potentially tragic consequences of Islamist endorsement of sectarian policies, which threaten not only to rip the country apart but the region as well. Mobs in the Egyptian village of Abou el Nomros lynched four Shi’a citizens on June 23 and injured many others in an assault that extended over several hours. The accounts of human rights organizations’ fact finding missions and eyewitness accounts tell the same story: Sheikh Hassan Shehata, a leading Shi’a figure was on a visit to one of the 200 or so Shi’a followers who live in the village of Abou el Nomros in the governorate of Giza. The village chief (al omda) warned Sheikh Hassan Shehata to leave as the inhabitants were enraged by his presence: he refused. Shortly thereafter, 5,000 residents, led by the Muslim Brotherhood and the Salafis attacked and destroyed the house in which he resided, pulled him and others out, dragged them through the streets, hitting them with sharp and hard objects and fatally wounding them. The Arab Network for Human Rights’ (ANHR) fact finding mission discovered that the police previously knew of the planned attacks on the Shi’as but did nothing to prevent them, and that the very attacks which lasted for over three hours happened in their presence. As Egypt gears up for big demonstrations against the Muslim Brotherhood, it's time to remember that you can't have genuine democracy without respect for religious freedom. What's going to happen in Egypt on June 30? That's the question many are asking as Freedom and Justice Party (FJP) leader Mohamed Morsy marks one year in office as president of Egypt. According to a recent Zogby poll, while 57 percent of Egyptians were full of hope after Morsy won a democratic election that was seen as a positive development for the country, today that support has dropped to 28 percent, and almost all of it comes from the FJP and the Muslim Brotherhood. The poll found a whopping 70 percent of the electorate is dissatisfied with President Morsy's policies and performance and are concerned that the Brotherhood "intends to Islamize the state and control its executive powers." As Egyptians of all factions prepare to demonstrate in mass against the Muslim Brotherhood and President Morsi’s rule on June 30, the latter has been trying to reduce their numbers, which some predict will be in the millions and eclipse the Tahrir protests that earlier ousted Mubarak. Accordingly, among other influential Egyptians, Morsi recently called on Coptic Christian Pope Tawadros II to urge his flock, Egypt’s millions of Christians, not to join the June 30 protests. While that may be expected, more troubling is that the U.S. ambassador to Egypt is also trying to prevent Egyptians from protesting—including the Copts. The June 18 edition of Sadi al-Balad reports that lawyer Ramses Naggar, the Coptic Church’s legal counsel, said that during Patterson’s June 17 meeting with Pope Tawadros, she “asked him to urge the Copts not to participate” in the demonstrations against Morsi and the Brotherhood. The ties between the Muslim Brotherhood and the Muslim Students' Association (MSA), found on hundreds of campuses across Canada and the USA, are well documented. At the University of Toronto, Canada's largest university, the MSA has a formidable presence and a membership of over 1,500 students, faculty and staff. They present themselves on campus as a legitimate faith group that seeks to serve students. However, their radical Islamic ideology is more than evident. An American aid worker on trial in Egypt was sentenced to two years in prison on Tuesday after being found guilty of illegally promoting democracy. More than 18 months after he was arrested at gunpoint by Egyptian authorities and placed on trial for the crime of promoting democracy, Robert Becker will likely appeal the decision. 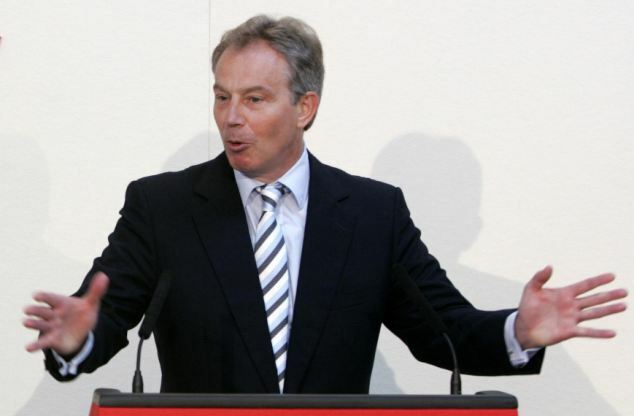 Tony Blair today makes his most powerful political intervention since leaving Downing Street by launching an outspoken attack on ‘the problem within Islam’. The former Prime Minister addresses the shocking killing of Drummer Lee Rigby in Woolwich by going further than he – or any front-rank British politician – has gone before over the issue of Muslim radicalism. Most recently on 30th April 2013 Egyptian authorities jailed an anti-Islamist activist on charges that included insulting President Mohamed Morsi, state news media said. After turning himself in to prosecutors, the activist, Ahmed Douma, was transferred to a prison to be held for four days. Mr. Douma has been a vocal critic of Mr. Morsi and his allies in the Muslim Brotherhood, using social media and joining anti-Islamist protests. Human rights groups have accused Mr. Morsi and his allies of targeting their critics in politically motivated prosecutions — a charge Mr. Morsi’s aides deny. On 10 May Ahmed Maher the Chairman of 6 April movement was detained for insulting the interior Minster. Several activists and opposition journalists were killed during demonstration in mysterious circumstances for example El-Hossini Abu-Dif who was killed outside El-Ethadiah palace during a demonstration against president Moursi many fingers point to government agencies assassination rather than the official post-mortem report attributing his death to Car accident. Egyptian President Mohammed Morsi submitted to parliament on Wednesday a controversial bill regulating NGOs and human rights groups but said it did not impose restrictions on their activities.An earlier draft had drawn criticism from activists, Western governments and the United Nations human rights chief, who said it was more stifling than regulations under the deposed President Hosni Mubarak. 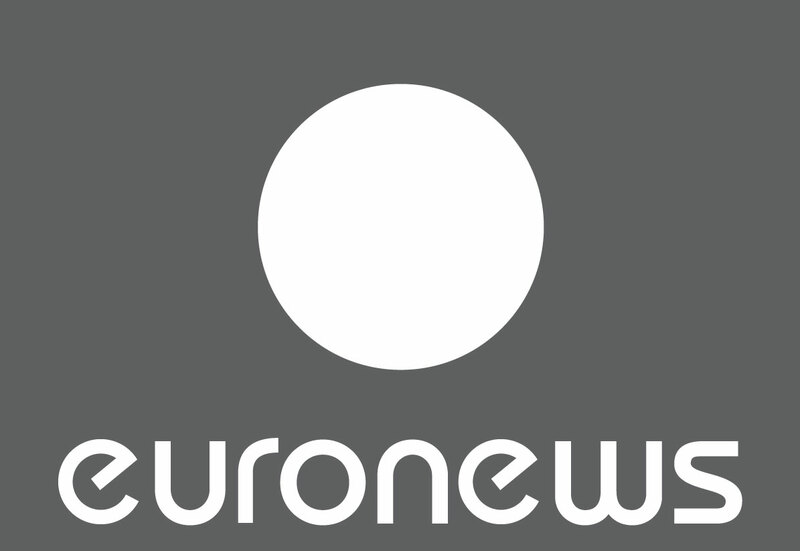 “This law remains restrictive because it allows the government to control NGOs access to funding, both foreign and domestically and it allows for government interference in NGO activities,'' said Heba Morayef, Egypt director for Human Rights Watch. The new draft stipulates that a steering committee supervising NGO activities “may seek assistance” from whoever it wants, including security officials. On this Memorial Day, it’s important to remember that the very same U.S. policies that created al-Qaeda in Afghanistan in the 1980s—leading to the horrific attacks of 9/11—are today allowing al-Qaeda to metastasize all around the Muslim world. As in the 80s, these new terrorist cells are quietly gathering strength now, and are sure to deliver future terror strikes that will make 9/11 seem like child’s play. Once limited to Afghanistan, al-Qaeda, thanks to U.S. policies, has metastasized around the world, and is in the consolidation/training phase for the new jihad. To understand this dire prediction, we must first examine the United States’ history of empowering Islamic jihadis—only to be attacked by those same jihadis many years later—and the chronic shortsightedness of American policymakers, whose policies are based on their brief tenure, not America’s long-term wellbeing. In the 1980s, the U.S. supported Afghani rebels—among them the jihadis—to repel the Soviets. Osama bin Laden, Ayman Zawahiri, and countless foreign jihadis journeyed to Afghanistan to form a base of training and planning—the first prerequisite of the jihad, as delineated in Sayyid Qutb’s Milestones. 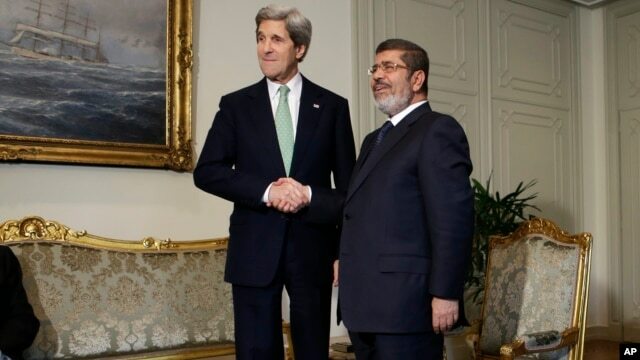 U.S. Secretary of State John Kerry shakes hands with Egyptian President Mohamed Morsi at the Presidential Palace in Cairo, Egypt, March 3, 2013. WASHINGTON — Almost a year after a Muslim Brotherhood candidate was elected president of Egypt, the United States is still trying to recalibrate its relations with a country that for decades has been one of Washington’s closest allies in the Middle East. Muslim Brotherhood candidate Mohamed Morsi won the presidency last June promising voters they would have more civil rights than under former president Hosni Mubarak, who was forced from office during the Arab Spring uprisings that shook the Middle East and North Africa. In the fall of 2012, three mothers, along with their infant children, begin serving one-to-two-year prison terms in Iran. Their crime? Being Baha'is in the birthplace of their faith. In February 2012, a man is jailed without charge in Saudi Arabia. Why? According to authorities, for his own safety because he allegedly "disturbed the public order" by tweeting comments deemed to insult the religious feelings of others. 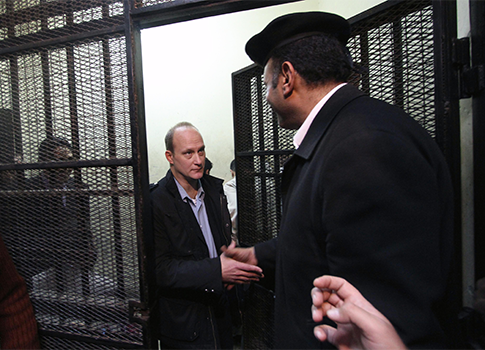 In December 2012, an atheist blogger is sentenced to three years in prison in Egypt. His offense? Posting online content that allegedly "insulted God and cast doubt on the books of the Abrahamic religions." These are just some of the many examples of the contempt that governments in the Middle East and North Africa (MENA) often exhibit toward freedom of religion or belief. Since the onset of the Arab Awakening in early 2011, religious freedom conditions have not improved, but declined. While larger hopes for justice and democracy are experiencing convulsive birth pangs, majority and minority religious believers alike face increasing government repression in many MENA countries; sectarian violence is on the upswing; and violent religious extremism is fueling regional instability. Read more: National Soncionce Front "Arabic"
Jihad! Terrorist! Radical Islamist! Are those words difficult to pronounce? Apparently, the administration and the mainstream media are unable to let those terms pass their lips. Since the Boston Marathon bombings, the brothers have been proven to be actual terrorists via emails, Facebook postings, interviews with relatives and indisputable evidence, such as munitions strapped to the body of the elder of the two. Tunisia and Egypt are emblematic of the Arab Spring. Both similarities and contrasts have marked their paths. Now they seem to be heading into a new Arab winter. Moncef Marzouki has been Tunisia’s president since December 2011, a secularist human rights activist. Egypt’s president since June 2012 has been Mohamed Mursi, candidate of the Muslim Brotherhood. The people of both countries elected each democratically, the first time they’d had the chance, after getting rid of their respective dictators, Ben Ali in Tunisia and Mubarak in Egypt. The Tunisian vote handed the Ennahda Islamists a 42% majority of parliamentary seats, so they are the senior partner in a coalition government with the secularists, with Ennahda’s Hamadi Jebali as the prime minister. But hopes swiftly soured, replaced with disappointment. Turbulence returned, becoming more and more violent. Salafist groups attacked anyone or anything they found contrary to hardline Islamic sharia law, which they sought to impose. Finally, there are the many layers produced by Egypt's geographical location as a Mediterranean society, more specifically, as an Eastern Mediterranean country with its opulent diverseness from trade. This complex construct, which formed over millennia, the rich and multi-layered Egyptian identity – a product of fruitful interaction and cross-fertilization among different civilizations and cultures – is today in grave peril, facing as it does systematic and deliberate attempts to destroy its very essence as represented in the many layers that make up its variegated character. Until this week, many observers may have still wondered what kind of rulers the Muslim Brotherhood are in Egypt. Since assuming office last June, questions were being raised around the dubious power-consolidation strategy carried out by President Mohammed Mursi, the democratically elected Brotherhood candidate who came into power on the back of the demise of the Mubarak regime in 2011. However, there was very little room left for uncertainty recently, when a highly disturbing video of Egyptian police brutality went viral. The footage shows police officers stripping middle-aged protester Hamada Saber naked, and beating him senseless in front of the presidential palace; this was said to have taken place last Friday. ON A crisp Sunday morning, the start of the Muslim week, a burgeoning congregation of Christians files into a church in Ankawa, a suburb of the Iraqi Kurds’ capital, Erbil, to which several thousand Christians have fled in the past decade from the violence of Baghdad. Though physically fairly safe in their new abode, it is hardly a happy haven. Many are struggling to survive. Jobs are scarce, so some make the perilous journey back to the Iraqi capital every week to work. The lot of Iraq’s Christian population is particularly glum. Though a steady trickle had been leaving for decades, the exodus became a flood after the American invasion in 2003, when radical Islamists unleashed a sectarian onslaught against Shia Muslims, Christians and others. The ferocity of attacks such as the one against the church of Our Lady of Salvation in Baghdad in 2010, which left at least 58 Christians dead, speeded the departure of many more. In the past decade as many as two-thirds of Iraq’s 1.5m Christians are thought to have emigrated. The Salafi sheikh on Egyptian TVUnlike the Muslim Brotherhood, which was founded much earlier, doublespeak is not second nature to the Salafis. Historically, the jizya (tribute) was money that conquered non-Muslims had to pay to their Muslim overlords to safeguard their existence (as indicated in Koran 9:29). And this is not the first time of late that Muslims have called for non-Muslims -- especially Christian minorities under Islam -- to resume paying the jizya, which was abolished in the nineteenth century thanks to European intervention. The immediate response to the Sahara atrocity must be revulsion, and deep sorrow for the families of those British and other hostages who were murdered in cold blood or killed in the rescue attempt. 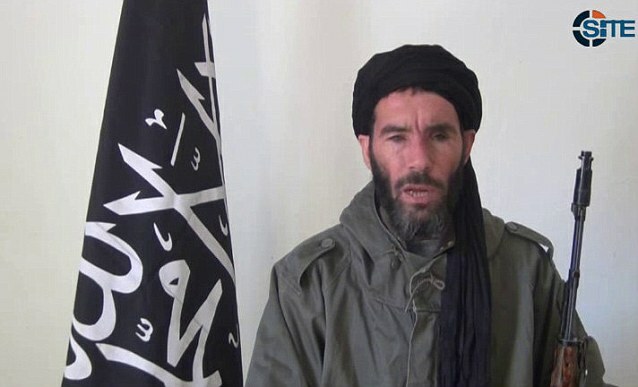 Condemnation of the Algerian authorities for the loss of those hostages’ lives, in what has been termed a ‘bungled’ operation against the Islamist terrorists who stormed the Algerian gas complex, is nevertheless inappropriate. The Prime Minister yesterday struck a more supportive note than his earlier reported fury that the Algerians had gone in with all guns blazing without even informing the UK government. Who is sane..who is mad "Arabic"
إستعادوا عقلهم أم لا يزالون يحتاجون للعلاج. المريض "خيشة و جردل" لتجفيف الأرض. فإذا ما قام المريض بمحاولة تجفيف الأرض مباشرة دون غلق الصنبور أولاً فهذا دليلاً و علامة على أن ذلك المريض لا يزال يحتاج للعلاج. 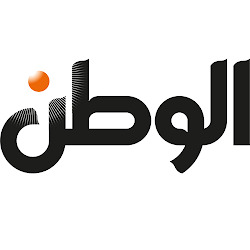 أما إذا قام أولاً بغلق الصنبور و بعدها استخدم " الخيشة و الجردل" فإن ذلك يدل على سلامته و حسن إدراكه للمشكلة. و ما يحدث فى مصر يا سادة هو تجاهل لحقيقة ما يحدث أو عدم إدراك للمشكلة الحقيقية. Read more: Who is sane..who is mad "Arabic"
If I Were a Copt. In February, 1987 Pope Shenouda III read my article about the Egyptian National hero Saad Zaghloul (1859-1927) and the Copts. Between February, 1987 and February, 2012 I had in excess of 60 long meetings (from a minimum of two hours to two full days together in the desert). In these four-eye meetings, we talked about post-Mohamed-Aly Egypt, the history of the Alexandria Cathedral (St. Marc Cathedral) that was established by St. Marc the Evangelist in 42 AD, Egyptian Monasticism, the famous Coptic Patriarchs, the First Council of Nicaea in 325 AD and Chalcedony 451 AD in particular and spent numerous hours discussing extremely complicated theological problematics ( particularly the history of Monosphyites). Read more: If I Were a Copt. Even those who know me well do not fully understand how my early childhood in Egypt shaped me into the spokesperson I am today. As an outcome of my upbringing, I am an avid fighter for free speech and openly expressive about the need for religious tolerance in society. I was born in Cairo, Egypt, into a Coptic Christian family during the time of King Farouk, just before his overthrow and replacement by President Nasser – a significant turning point for Islam and for Egypt which would influence my life forever. Tens of thousands of Egyptian Christians are leaving the country in the wake of the Egyptian revolution and subsequent Islamist takeover of politics, priests and community leaders say. Coptic Christian churches in the United States say they are having to expand to cope with new arrivals, as priests in cities like Cairo and Alexandria talk of a new climate of fear and uncertainty. "Most of our people are afraid," Father Mina Adel, a priest at the Church of Two Saints in Alexandria said. "Not a few are leaving - for America, Canada and Australia. Dozens of families from this church alone are trying to go too." CAIRO (Reuters) - As cities along the Suez Canal erupted in violence in late January, the leader of Egypt's armed forces feared for the future of the fledgling democracy. General Abdel Fattah Sisi told the elected president, Mohamed Mursi, that the situation was critical, according to Egyptian security sources familiar with the events. "The military leadership advised the president that national security was threatened following the chaos and vandalism that befell the cities of Suez and Port Said," a security source with links to the military told Reuters. The two men discussed ways to contain the unrest along the Canal, which is vital to Egypt and global trade, agreeing the army could not stand by and let the turmoil spread. Early on Saturday January 26 troops deployed in the riot-torn cities; in Suez armored vehicles arrived to protect government buildings. Mursi announced a night-time curfew in the towns. IN A new year’s message Muhammad Badia, the Supreme Guide of Egypt’s Muslim Brotherhood, advised his followers to temper resilience with magnanimity. “Be like the tree which, when battered by stones, drops its finest fruit,” he said. His most prominent adherent, President Muhammad Morsi, has certainly proven resilient. Ignoring a tide of opposition that has swollen since he took office in June, Mr Morsi pushed through a controversial referendum in December to endorse a new constitution. Since then he has faced down challenges from Egypt’s restless judges, braved serial resignations of advisers and ministers, and parried opponents by sponsoring a national dialogue that is actually being held just by Brothers and their allies. At elections next month for the lower house of parliament, the Brotherhood’s party looks set to do well. In the interim, thanks to an election last year when only 10% voted, it controls the previously weak upper house, which the new constitution has helpfully turned into Egypt’s sole if temporary legislature. We waited and waited, hour after hour for the airing of the President’s interview on TV, disgruntled at the disrespect the presidency insists on showing the Egyptian people. I personally waited until past midnight, then decided to sleep, which was in fact a good decision. I have work in the morning, like most Egyptians (those who still have jobs). Our rulers work at night, though. They make statements and speeches and interviews after midnight. Announce decisions and presidential decrees and constitutional amendments on the wee hours of the morning. Pass constitutions at dawn. Read more: Shake it, shake it baby! CAIRO (Reuters) - Egypt reshuffled its government on Sunday to strengthen Islamist control and pledged to complete talks with the International Monetary Fund on a $4.8 billion (2.9 billion pounds) loan deal to stave off a currency crisis that risks igniting more unrest. A senior IMF official is due in Cairo on Monday to meet Egyptian leaders over the deal, which was postponed last month to give Egypt more time to tackle political tensions before introducing unpopular austerity measures. Finance minister Al-Mursi Al-Sayed Hegazy was sworn in by President Mohamed Mursi as part of a reshuffle that expanded the Islamist Muslim Brotherhood's direct control over ministries. 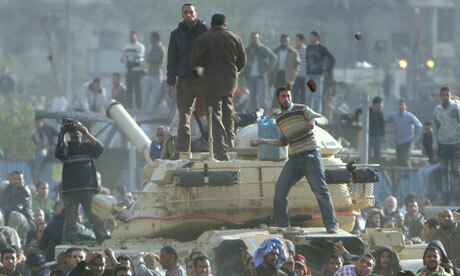 Cairo: An Egyptian opposition group has accused the government of covering up torture at the hands of security forces. The charge comes after a government forensic report claimed that 28-year-old activist Mohammed el-Gindy was killed in a car accident. It contradicted family and friends, who say he died after he was electrocuted and beaten on his head repeatedly in detention earlier this month. Members of an Egyptian Muslim family light candles at a Coptic Christian church in the historical centre of Cairo on January 6, 2013. Egypt's minority Coptic Christians celebrate on Monday their first Christmas under Islamist rule and amid a climate of fear and uncertainty for their future. An Egyptian Coptic Christian woman stands outside a church in the historical center of Cairo on January 6, 2013. Egypt's minority Coptic Christians celebrate on Monday their first Christmas under Islamist rule and amid a climate of fear and uncertainty for their future. AFP - Egypt's minority Coptic Christians celebrate on Monday their first Christmas under Islamist rule and amid a climate of fear and uncertainty for their future. "I do not really feel safe," says Ayman Ramzi, who feels his community threatened by the rise of Islamists in the world's biggest Sunni Arab nation.